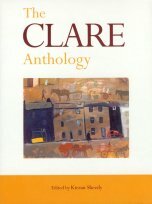 The Clare Anthology contains a selection of prose and verse by native Clare writers and visitors to the county. A mixture of fact and fiction, the material covers various aspects of the county's past including folklore, sport, politics and romance. The diversity of both authors and subject matter produces a lively and engaging picture of the daily life and special occurrences which helped to shape County Clare and its people. A poetry-smitten widow, an executioner rogue. The O'Briens, MacNamaras - and ordinary people. If you're looking for Clare, search no more, its here! Kieran Sheedy is a native of Feakle. His published works include Upon the Mercy of the Government (1988), Feakle, a History (1990), The Clare Elections (1993) and The United Irishmen of Clare (1990).